Over the past few years I have been fortunate enough to perform the music and pay tribute to the greatest entertainer of all time, Freddie Mercury. I've thoroughly enjoyed performing to the most enthusiastic audiences all over the country and overseas. It's been a fantastic journey and long may it continue for many years. Thanks for dropping by and I look forward to seeing you soon, in the meantime please feel free to click on the different tabs below to get more information on my shows. Dean Richardson as Freddie Mercury faithfully recreates the image, voice and flamboyancy of the great man himself. Audiences are always left amazed by the authenticity and intricate detail Dean puts into each and every performance. From the moment the music begins and the lights pulsate, Dean explodes onto to the stage and from then on, the energy and exuberance never stops flowing. From the stunning vocals to the mannerisms, from the outlandish costumes to the moustache, it's all there to ensure that the audience have the very best experience. 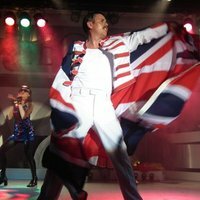 Dean Richardson as Freddie Mercury solo show is available as a fully self contained tribute act and also with full band parts for cruise work and more. In addition, Dean is also available with a fantastic Brian May tribute in their powerful two piece show. For a more in depth look into Dean's personal journey please check out the profile page. In 2009, Dean was asked by tribute impresario Trevor Chance to audition for his show, Legends. 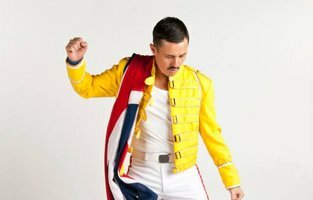 From the initial sound check, Trevor Chance voiced his enthusiasm with Dean's vocals as Freddie Mercury and since then, has enjoyed very successful consecutive summer seasons in Blackpool. 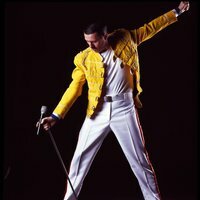 Playing to over 36,000 people in a single season, in excess of 150,000 have been thrilled by the performances of Dean Richardson as Freddie Mercury and the other fantastic cast members at Legends. 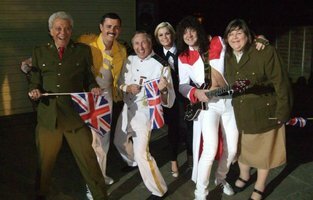 In addition to the summer season, Dean also performs with Legends at various locations including last years Christmas shows at Leeds Armouries to 1000 guests every night, as well as numerous shows for their corporate clients up and down the country and abroad. Playing to a packed audience night after night at the famous Blackpool Tower Ballroom last season Dean is thrilled to be part of the team continuing into 2019 and beyond. Legends featuring the best lookalike and soundalike artistes in the world, Trevor Chances Legends stars a fantastical array of live music performers. Your favourite stars all framed in a fabulous high energy production. Hour after hour of the best selling songs that made these Legends so successful gives the audience a seamlessly magical trip to the greatest music of the last 50 years. Since Legends began Chance Promotions have only ever featured the very best look, soundalikes in the world. Many artistes have joined the queues of people hoping to emulate their idols on the Legends stage, but only a handful make the grade to become part of this very elite club.